Many suitcases and boxes filled with photographs were discovered in the basement of the Museum building in Bzinica Stara. These images were a revelation to my living relatives in the United States, who had never had any visual record of our ancestors in Poland. Some of these images are attributed to my Great Grandfather Victr, who practiced “Spirit Photography.” These specialists could capture in photographs what the normal eye could not see, either by use of specially equipped cameras or because of their unusual mental and spiritual powers, or perhaps both. Whatever the means, they recorded oddly powerful and uncannily revealing images. 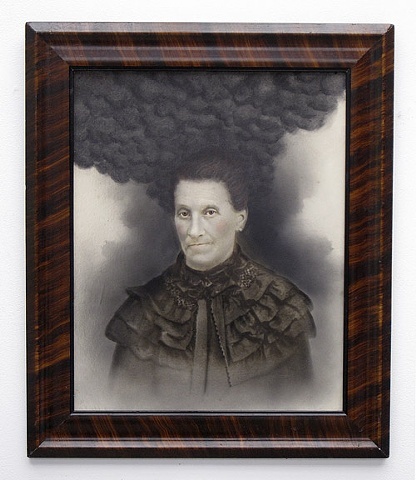 One especially notable example is this portrait of my Great Grandmother, Magda, who had a legendary temper and “evil eye,” which was said to make even the most resolute soul whither in her searing gaze. When Victr made this “spirit photograph” of Magda, it unfortunately made visible the dark cloud of her nature.